This is another of the kid-friendly meals I found on Better Homes and Gardens a few weeks ago. 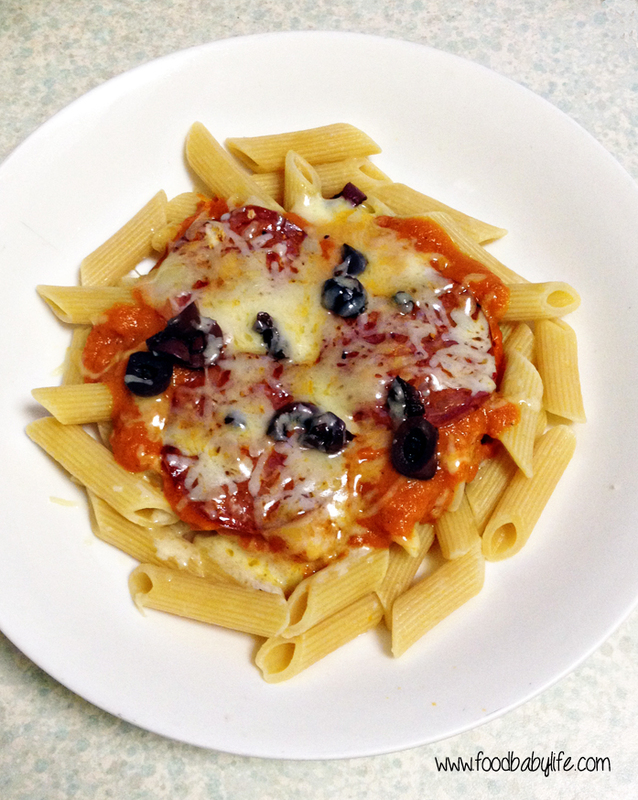 It sounded easy and delicious and was a nice twist on both pizza and pasta, both of which we eat about once a fortnight. So this dish is pretty much exactly what it sounds like, all your favorite pizza toppings on bed of pasta. So simple I can't believe I've never thought of it before! As with last time there were no quantities available as I copied it down directly from the show but I have included what I used and my method. I knew Mr 6 would love it - he eats pretty much anything except visible onion which absolutely must be picked off even if he can't taste it. Mr 4 would be a different matter. He has slowly come around to pizza but not with sauce. He generally has a plain base with olives, pineapple and cheese and calls it 'cheesy bread.' He is also just starting to come around to pasta but definitely not with any thing else touching it. In the end he ate some pasta from around the edges of the plate (none with melted cheese on) and a few olives but wasn't particularly impressed. Anyone else with fussy kids? I would love to hear your tips and tricks! To make the sauce, finely chop the celery, carrot and onion and fry off with the olive oil in a large pan over medium-high heat. When it is just starting to soften, add the garlic and cook for another few minutes. Add the remaining ingredients and simmer for about 15 minutes until the vegetables are completely cooked and the sauce is thick and smells amazing. You can use the sauce as is or puree it like I did using a stick blender or food processor (you will need to let it cool down a bit first). To assemble the dish, place a serve of pasta in each bowl (ovenproof), top with a generous amount of sauce then the pepperoni, olives and cheese. Place the bowls under the grill for a few minutes until the cheese melts. Make sure you let the bowls cool down before giving them to the kids!